By a sound like many lights long before dawn. They punctured the calm my brain was self-willing. In the swamp a thousand small frogs were all thrilling. This is the most delayed spring I can ever remember. 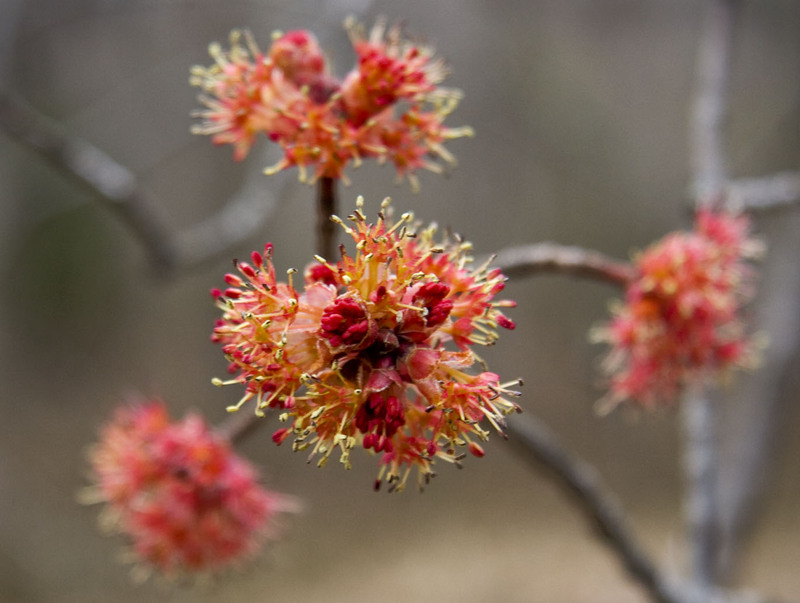 Usually the maples tantalize, for they start to bud out in late March, but are only flirting. Most years there is a long period where the forest is hazed by golden green and purple, and has lost the starkness of winter, as every twig is topped by a swelling bud, but the buds never bust out. A sort of prolonged reluctance becomes the mood, as the world awaits the true bursting out of May in all its glory. But this year the buds remained winter gray even in late April. Our first daffodil finally unwrapped its petals in slow motion on April 23. The forecast is for temperatures to soar next week. Yesterday we had a hard time getting up to fifty (10°C) but next week we may touch eighty (27°C) . 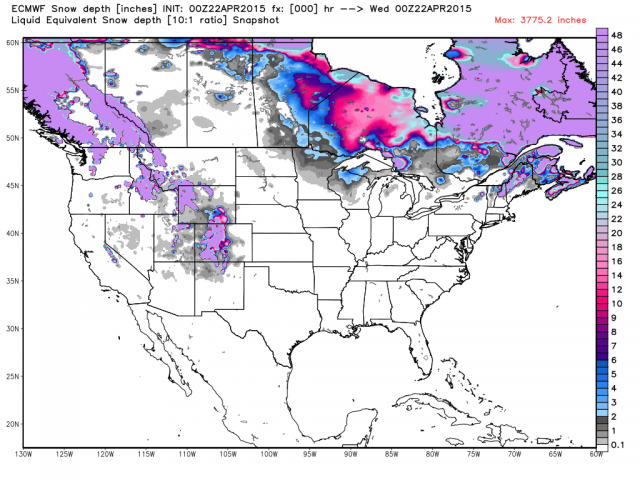 I fully expect to wind up dazed, as around five weeks of spring will be compressed into 120 hours. One likes to linger over springtime, as one does a fine glass of wine, but this will be like chugging a whole bottle at once. Around here we’ll all be reeling. This past week has seen a reversion to wintry weather, with frost on the windshields and ice in the puddles. The budding trees have hit the brakes, and the ponds have gone nearly silent. 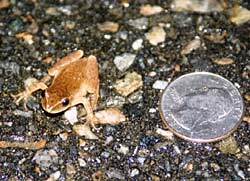 Back when the weather was more kindly, on April 16, I heard the first frogs, which are not the spring peepers but another small frog I’ve heard called “banjo frogs” (perhaps because they make a “Twank” sound, a bit like a breaking banjo string). (The Australian frog with the same name actually sounds more like a banjo.) I call them “spring quackers” because they also sound a bit like ducks. They are lower and quieter than peepers, and always seem to beat the peepers by a day or two, when it comes to announcing the ponds are coming back to life. They are far less obvious than the peepers are. Where the peepers peep is piercing and shrill, the quackers are more of a low muttering, almost subliminal. At our childcare I asked a small girl, around age three, if she could hear them, and at first she shook her head. Then her eyes changed, and she tilted her head, and looked off curiously through the trees. I asked her if she’d like to sneak closer, and she nodded. (Most kids like to sneak.) Then we crept through the pines, and it was wonderful to watch the child’s face fill with wonder as we drew closer and the plaintive “twanking” became more obvious. However then my idiot dog came lunging through the underbrush, plunging along the side of the pond to see what we were up to, and the frogs immediately became silent and the water ahead was dimpled with rings of ripples. I told the girl my dog wasn’t very good at sneaking, and she nodded. By the next day the peepers had started their shrieking, and all the subtlety was lost. They demand attention, which doesn’t seem a very good survival strategy, until you sneak up on them and understand they confuse predators by being both numerous and deafening. It is hard to locate a single frog by its peep, with so many other peeps coming at you from all angles. And they also become immediately silent, if you move too fast. I find them amazingly difficult to locate. They are also amazingly loud, once you see how small they are. They also can stand being frozen solid, due to some sort of antifreeze in their blood. This was a good thing, as the promise of spring seemingly became a lie. Just as the first frogs are tiny, so are the first blooms on the swamp maples, which are the first tree to bud out. The lowlands go from being silvery thickets to being touched by a raspberry mist I have yet to see captured by a photograph, but you have to poke your nose close to see how lovely the individual flowers are. Ours are a bit more purple than the the flowers pictured above, and they look a lot worse after they’ve been blasted by frost. I’m going to watch, to see if they make many seeds this year. We got into a northwest flow on Tuesday that wouldn’t quit, and were still in it on Friday. A few flakes were in the roaring wind on Wednesday, and Thursday’s purple clouds kept pelting us with white, Dr. Seuss pompoms of fluffy hail called “graupel”, and Friday morning began with a whirling flurry that briefly made the view look like January, though it never stuck to the ground. It was not weather conducive to ambition, in the garden, which turned out to be a good thing, for my wife had other ambitions. I wound up repairing the fence in front of the house, as the winter’s plows trashed what little was left of the old one. 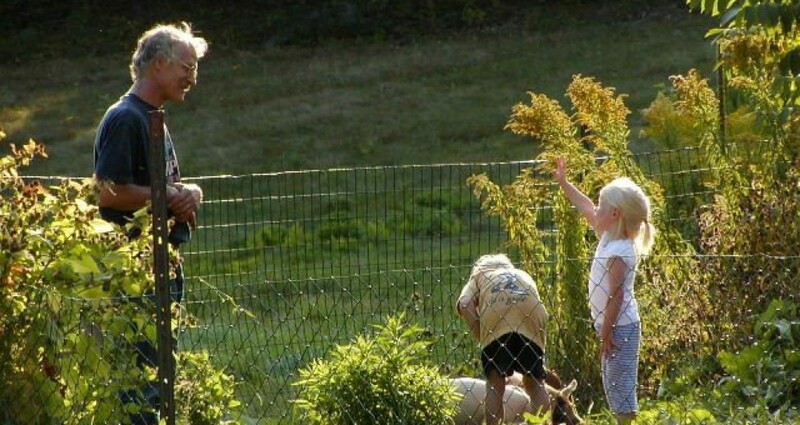 I fear I spend so much time over at the farm that I neglect my home, and the lack of care shows, and annoys my wife. The Memorial Day parade comes down Main Street and passes right in front of our house, and my wife doesn’t believe me when I say all eyes are on the parade and not our house. Consequently I spend time every spring at home, sprucing the place up, right when I feel I should be gardening. There actually was a parade this morning, but as usual I always forget it, and get a shock. At the start of the baseball season the children are marched from the fire station to the ball field with blaring fire engines and police cars, and every year I think it is a terrorist attack. After watching my grandson in his first game my ambition was to nap, but my middle son has the ambition to grow pear trees and see if he can start a microbrewery making a sort of pear cider called “perry”. This is a long-term project, but in the short term involves planting four trees at the childcare, and also involves controlling my goats, so they don’t eat his saplings. This in turn involved repairing the electric fence, so that is what I wound up doing rather than snoozing. Rather than rested I wound up feeling as you’d expect, after fighting with cold wire in a cold wind. My ambition is now to simply survive until noon Monday. Sunday will not be a day of rest for me, as I am giving the sermon at our church. We have dwindled to a size so small that, fort the first time in 265 years, we can’t afford a pastor or interim pastor, and instead have “guest speakers” which includes our selves, (as we are cheapest) (IE free). We don’t call our sermons sermons, but rather call them “messages”, but mine will be a sermon all right. My “message” is liable to be grouchy, as I have to fast on clear fluids, and then later in the day flush out my system and spend a lot of my time on the toilet, as my doctor wants to have a look inside my colon first thing Monday morning. It is hard to be happy about this prospect. A man of my advanced years expects to be treated with more dignity than that, especially right after giving a sermon at church. It is hard to see much hope in the current map, with the warm rains suppressed so far to the south. However with the sun as high as it is in mid-August, spring is only seemingly denied. This morning, even with a skim of ice on puddles, when a beam of sun pooled in the east-facing shallows of the pond, a single peeper let out a solitary yelp. And I remind myself the ice was still thick enough to walk upon, on April first. Things have melted; spring isn’t denied. The buds only seem on hold. Trees are very smart, for a being without brains, and they know when to bust out all over. 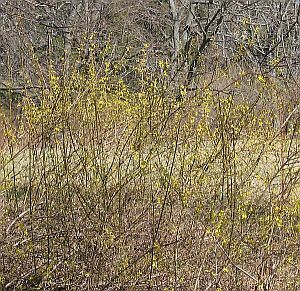 The forsythia is yellower every day, even without blooming, and, even as I stood sulking by my garden yesterday, a bluebird landed on a fence-post nearby. It’s hard to argue with that.